Aim: to study the diagnostic significance of volume capnography in examination of patients with severe and moderate bronchial asthma (BA). Materials and Methods. 171 patents were examined, of them 43 patients with severe BA and 45 patients with moderate BA. The control group included 83 relatively healthy volunteers. In all the participants, along with clinical examination, parameters of spirometry and volume capnography were determined using ultrasound computer spirograph SpiroScout (Ganshorn, Germany) equipped with a volume capnography function. Results. Volume capnography revealed the following changes in patients with BA in comparison with the control group: increase in the slope of phase III (indicates non-uniformity of ventilation and perfusion in the lung periphery due to pathology of the small airways) and increase in emphysema index (indicates hyperinflation of lung). The above indices had statistically significant differences in severe and moderate asthma. Based on the results of examination of healthy individuals, the normal values for the slope of phase III (<0.31 g/mol·L) and emphysema index (<43) were calculated. Diagnostic sensitivity and specificity of volume capnography were studied with subsequent construction of ROC-curves and calculation of AUC for the slope angle of phase III and for emphysema index. It was found that most informative in BA are parameters of specificity of the diagnostic test (slope of phase III – 90.32%, emphysema index – 96.77%). The subsequent construction of ROC-curves showed that the AUC value for slope of phase III and emphysema index was higher in severe BA compared to the moderate BA (0.74 and 0.86, respectively). Conclusion. The obtained data demonstrate the significance of volume capnography in the functional diagnosis of respiratory disorders in BA. bronchial asthma, volume capnography, emphysema index, small airways. At present a stable tendency is noted to world-wide increase in the number of patients with bronchial asthma (BA) including Russian Federation [1,2] which necessitates improvement of diagnostics and treatment of this disease. The main factor that determines clinical symptoms in BA is bronchial obstruction that leads to respiratory dysfunction. The acknowledged «gold standard» of diagnosis of ventilatory disorders in broncho-obstructive syndrome is spirometry . However, this method has a number of limitations, for example, difficulties in performing forced respiratory manoeuvers, especially by patients with severe BA, that does not permit correct interpretation of the results of examination [3,4]. Spirometry does not permit to determine the expressiveness of hyperinflation of lung and the condition of small airways (SA) which, in modern understanding, play a significant role in the pathogenesis of BA [5-7]. These facts stimulated search for new instruments of evaluation of the lung function that could become an alternative to spirometry in some clinical cases. In this aspect, of special interest is a method of volume capnography that requires no forced respiratory manoeuvers and reflects alterations in SA and the presence of hyperinflation of lungs in patients with BA. Volume capnography records a pattern of elimination of CO2 of the expired air in relation to the tidal volume (in contrast to traditional capnography that evaluates release of CO2 depending on time) [8,9]. A graphic presentation of this method is a volume capnogram (Fig.1) that is required for further calculation of some parameters: dead space, slopes of I, II and III phases, emphysema index and etc. . In the curve (Fig.1) three phases are distinguished. Phase I characterizes CO2 of the anatomical dead space, that is, the gas of the upper airways which contains little amount of CO2 (usually compared to zero) and is used in resuscitation practice to calculate the dead space of the breathing system . Phase II (dMM/dV2) illustrates fast buildup of concentration of CO2 due to addition of gas from alveoli and is the main parameter for calculation of the dead space. Reduction in dMM/dV2, and, consequently, reduction in the volume of the dead space is seen in bronchial obstruction . Phase III (dMM/dV3, alveolar phase, alveolar plateau) is determined by alveolar CO2 and indirectly reflects changes in the ventilation and perfusion of the lung periphery (SA) . A special calculated parameter of volume capnography is emphysema index (Vm25-50/VTin-s) – a slope of the regression line of index of mixed air with maximal concentration of СО2 from 25 to 50%. Emphysema index permits to indirectly evaluate expressiveness of hyperinflation of lungs . Aim to study diagnostic significance of volume capnography in patients with severe and moderate bronchial asthma. The study was conducted at the Department of Therapy and Family Medicine of the Faculty of Additional Professional Education, Ryazan State Medical University. The work was approved by the Local Ethical Committee of Ryazan State Medical University and complies with the requirements of Good Clinical Practice (GCP) and of the World Medical Association’s Declaration of Helsinki «Ethical Principles for Medical Research Involving Human Subjects». The study included 88 patients with severe (n=43) and moderately severe (n=45) BA above 18 years of age. The diagnosis of BA was established in accordance with the requirements of the global strategy of treatment and prophylaxis of bronchial asthma . The group of comparison included 83 healthy non-smoking volunteers above 18 years of age having no BA in history. The groups were comparable in gender and age (p>0.05). All studied individuals signed voluntary informed consent. There were excluded patients with diseases and conditions that could produce a significant influence on the function of the respiratory system and the studied parameter. The data of volumetric capnography and spirography were recorded using ultrasound computer Spirograph Spiro Scout (Ganshorn, Germany) equipped with the function of volume capnography (Fig. 2). Spirometry was conducted according to ATS/ERS standards . Statistical processing of the obtained results was carried out using Microsoft Excel 2013, Stat Soft Statistica, version 13 (USA). For evaluation of distribution of signs Shapiro-Wilk test was used. Taking into account other than normal distribution of the studied signs, the data were presented in Me [Q25; Q75] form, where Me – median, and Q25 and Q75 are lower and upper quartiles, respectively. Normal parameters of the volume capnography were determined in the control group by percentile method provided the distribution of a sign was normal. Here, the limits of the norm were considered to be an interval of measurement including 2 quadratic deviations above and below the average value, e.g., 95% of all measurements. Dependence of the quantity of correctly classified positive examples on the quantity of incorrectly classified negative examples was studied. Diagnostic sensitivity and specificity of the test were determined by construction of ROC-curves with the subsequent calculation of Area Under ROC-Curve (AUC). AUC=0.9-1.0 corresponded to excellent quality of the diagnostic test, AUC=0.8-0.9 – to high quality, AUC=0.7-0.8 – to good quality, AUC=0.6-0.7 – to medium quality, AUC=0.5-0.6 corresponded to unsatisfactory quality. A share of positive results of the test in the group of patients with BA (sensitivity, Se) and a share of negative results in the control group (specificity, Sp) was given in %. Prognostic significance of positive results (PSPR) and prognostic significance of negative results (PSNR) were evaluated for the slope of phase III and for emphysema index of volume capnography. The results of volume capnography and spirography of patients with BA and of respondents of the control group are given in Table 1. The slope angle of phase III (dMM/dV3, g/mol·L) was found to be higher in patients with BA as compared to respondents of the control group. Emphysema index (Vm25-50/VTin-s) also showed statistically significant differences between the groups and was higher in patients with BA than in representatives of the control group. Comparison of parameters of volume capnography and spirometry of patients with severe and moderate BA showed statistically significant differences between the compared groups: increase in the slope angle of phase III, in emphysema index and reduction in the forced expiration volume per the 1st second (% of the reference value) in patients with severe course of the disease (Table 2). In analysis of the results of volume capnography in relatively healthy individuals, normal values for dMM/dV3 (<0.31 g/mol·L) and Vm25-50/VTin-s (<43) were calculated. Diagnostic sensitivity and specificity of the test (with subsequent construction of ROC-curves and calculation of AUC) and also PSPR and PSNR for the slope angle of phase III and emphysema index were determined (Table 3). As seen from Table 3, parameters of specificity of the diagnostic test can be considered most informative. Here, of the highest diagnostic significance was emphysema index. Subsequent construction of ROC-curves showed that the value of AUC for dMM/dV3 (Fig. 3) and Vm25-50/VTin-s (Fig. 4) was higher in the group that included patients with severe BA. So, today there exist single publications about diagnostic significance of volume capnography in chronic obstructive pulmonary disease (COPD). P.V. Romerо, et al. (2007) observed an increase in AUC ROC-curves for dMM/dV3 depending on severity of COPD . In turn, S. Ponto, et al. (2016) showed a high diagnostic value of dMM/dV3 in patients with COPD (sensitivity 90%, specificity 86%) . However, there are no data in the literature concerning research of diagnostic significance of volume capnography in BA. Results of our study permitted to make the following conclusions. Method of volume capnography possesses high specificity in examination of patients with severe and moderate course of bronchial asthma (a slope angle of phase III – 90.32%, emphysema index – 96.77%). In severe course of bronchial asthma higher sensitivity of parameters of volume capnography were recorded (slope angle ofphase III – 50.0%, emphysema index – 60.46%); specificity of emphysema index in this case was 8%. The obtained data demonstrate significance of the studied method in the function-nal diagnosis of respiratory disorders in bronchial asthma. Chuchalin AG, Aysanov ZR, Belevskii AS, et al; Russian Respiratory Society. Federal'nye klinicheskie rek-omendatsii po diagnostike i lecheniyu bronkhial'noi astmy (2016). Available at: http:// spul-mo.ru/obshchestvo/news/news-812/. Accessed: 12 Apr 2017. (In Russ). Global Initiative for Asthma. Global strategy for Asthma management and prevention (GINA) (Updated 2017). Available from: http://ginasthma.org/ Accessed: 22 Oct 2017. Chuchalin AG, Aysanov ZR, Chikina SYu, et al. Federal’nyye klinicheskiye rekomendatsii Rossiyskogo respirator-nogo obshchestva po ispol’zova niyu metoda spirometrii. Pul'monologiya. 2014;(6): 11-24. (In Russ). doi: 10.18093/0869-0189-2014-0-6-11-24. Chernyak AV, Neklyudova GV. Spirometriya: kak izbezhat’ oshibok i povysit’ kachestvo issledovaniya. Praktich-eskaya pul'monologiya. 2016;(2):47-55. Rakita DR, Kuspanalieva DS. Vliyaniye giperventilyatsionnogo sindroma na kachestvo zhizni bol’nykh bronkhial’noy astmoy. 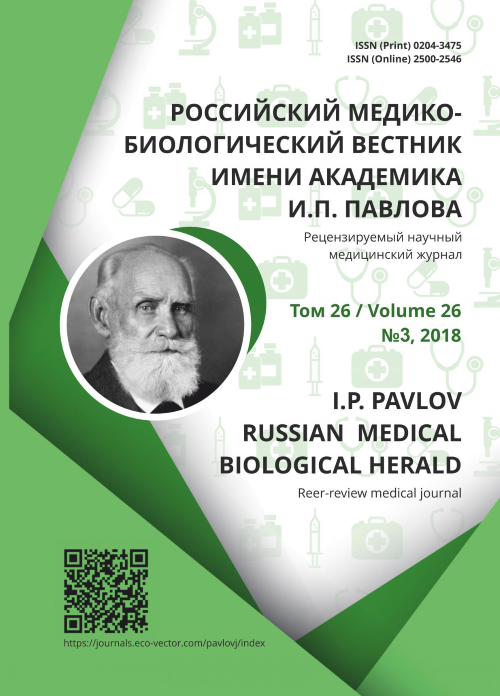 IP Pavlov Russian Medical Biologial Herald. 2012;(1):86-90. (In Russ). Avdeev SN, Aysanov ZR, Arkhipov VV, et al. Soglasovannye rekomendatsii po obosnovaniyu vybora terapii bronkhial'noi astmy i khronicheskoi obstruktivnoi bolezni legkikh s uchetom fenotipa zabolevaniya i roli malykh dykhatel'nykh putei. Prakticheskaya pul'monologiya. 2013;(2):15-26. (In Russ). Contoli M, Santus P, Papi A. Small airway disease in asthma: pathophysiological and diagnostic considerations. Cur-rent Opinion in Pulmonary Medicine. 2015; 21(1):68-73. doi: 10.1097/MCP.0000000000000122. Ponomareva IB, Subbotin SV. Possibilities of volumetric capnography method in the study of pulmonary functions in patients with COPD. Science of the Young (Eruditio Juvenium). 2016;4(1):68-73. (In Russ). Verscheure S, Massion PB, Verschuren F, et al. Volumetric capnography: lessons from the past and current clinical applications. Critical Care. 2016; 20:184. doi: 10.1186/s13054-016-1377-3. Gravenstein JS, Jaffe MB, Healthcare P, et al., еditors. Capnography. 2nd ed. Cambridge: Cambridge University Press; 2011. Bhalla AK, Rubin S, Newth CJ, et al. Monitoring dead space in mechanically ventilated children: volumetric capno-graphy versus time-based capnography. Respiratory Care. 2015;60(11):1548-55. doi: 10.4187/respcare.03892. Almeida CC, Almeida-Júnior AA, Ribeiro MA, et al. Volumetric capnography to detect ventilation in homogeneity in children and adolescents with controlled persistent asthma. Journal de Pediatria. 2011;87(2):163-8. doi: 10.2223/JPED.2077. Byalovskii YuYu, Miroshkina TA. Diagnosticheskoe znachenie ob’emnoi kapnografii. In: Kiryushin VA, editor. Ma-terialy Mezhregional'noi nauchnoi konferentsii Ryazanskogo gosudarstvennogo meditsinskogo universiteta imeni akademika I.P. Pavlova s mezhdunarodnym uchastiem. Ryazan: Ryazan State Medical University; 2014. P. 50-3. (In Russ). Romero PV, Rodriguez B, de Oliveira D, et al. Volumetric capnography and chronic obstructive pulmonary disease staging. International Journal of COPD. 2007;2(3):381-391. Copyright (c) 2018 Subbotin S.V.